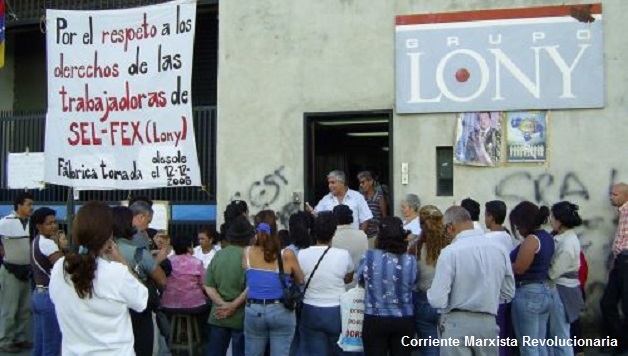 A group of around forty women have been leading a struggle for jobs and pay at the Selfex factory in the south east of Caracas for several weeks. The company, which makes women’s underwear under the brand name LONY, ceased production in August 2005 when the owners claimed they could no longer afford to produce. They attempted to send home the 250 strong workforce, telling them they were on enforced annual leave. The workers, 80% of whom are women, refused to accept this and insisted on their right to receive their pay, their meal tickets (a type of luncheon voucher) and their national insurance contributions. The workers had been paid their wages up until mid-December but then the owners claimed bankruptcy. On 12 December they occupied the factory, placing a large padlock on the outer entrance door and controlling all access to the building. We visited the factory when we were in Caracas in February for the World Social Forum. The women told us they had worked out a rota of shifts to ensure that the factory is occupied 24 hours a day, 7 days a week. They had seen nothing of the owners since December. Many of the women have strong doubts as to whether the owners are really as broke as they claim. They recall the time of the bosses’ lockout in 2003 and remember how the owners shut down the factory but the workforce insisted on coming to work. This time, the workers are just as determined. They believe the owners are waiting for them to tire of the struggle and go home. The women feel that the existence of the Chavez regime has created an environment in which they feel more confident of raising their demands. However, despite their faith in the Chavez project, it is still important that the workers are organised independently and formulate concrete demands, such as a demand that the company open its books, so that the workers can see where the profits are going. Workers could also explore ways of restarting production and call for nationalization under democratic workers’ control.